This is Aaron Nikhil from India. we had a Audio Electronics manufacturer in India by the name "COSMIC" from 1960's to 2004 & they made pretty Amazing Amplifiers (my Amp model was Cosmic LAB-3000 Stereomaster in which PD1515 were used as output Transistors) and Speakers, TT's, Cassette Decks, Eq's, Headphones too. So as time passed by inevitable realities kicked in my Amp and ended up losing PD1515 Transistor in one/left channel. So a equivalent BUX39 was used but even it went kaput, now I'm looking forward to replace all four transistors with Mr.Fezder's PD1515 Transistors I Hope ! Wish ! & Pray ! he comes back here or atleast someone could help me find him. Thanking you all in Anticipation ! If that's the case, they are a 200V 15A darlington; a BUX39 is only rated 120V. Can you measure the base-emitter voltage on the good PD1515 using a multimeter on diode test (with the amp completely disconnected and given time for the power supply to fully discharge)? The originals have not been made for 40 years or so, so the chances of finding good spares are next to zero. There _will_ be equal or better replacements available, it's just down to working out exactly what is needed. I often repair old machine tool electronics that can be 30 - 40 - 50 years old with obsolete parts & I've never yet failed to find an off-the-shelf way of replacing the obsolete parts; it's a matter of examining the circuit to work out the specifications of the original component. somehow I'm unable to open the link you posted, kindly help me with a Screenshot or something. 1.I don't think 2SD1515 are anyway related to PD1515 but I could be wrong also. I been told by the Cosmic Company Technical & Service Heads that 2N3055 can be used as an alternative but I know for sure they won't & can't sound same as PD1515 bcuz I have Same Model Amplifier with other Transistors which doesn't sound as Great as one with PD1515's. 3.You are absolutely right about BUX39 being inferior in one aspect that's the reason it went cold just few week later. I'll ask my Tech Guru about it & will provide you the results very soon. kindly be encouraging don't do this I request ! Our Dear fellow FM Mr.Fezder has PD1515's in abundance & he knows the source of PD1515 too ! so I'm been Praying thrice a day to see him on board again. I believe only you could help me find a superior replacement but I hope you won't be recommending SIT's (Static Induction Transistors/V-Fet's ) ;-) & I'll do whatever instructions you suggest. You Simply Rock Mr.Rjenkinsgb ! God Bless you Abundantly & this Forum as well ! For being soo Supportive & Helpful. & Thanks to All the Dear fellow Fm's who would be informing Mr.Fezder about me and my requirement of his PD1515's. For some reason I have never liked 2N3055s for most things, they do not have particularly good characteristics. It may be that there are just a lot of low-quality or reject ones about in the hobbyist market - but I avoid them for professional use anyway. I've "printed" that web page to a .pdf file, attached.. If a 2N3055 would supposedly do, an MJ802G should work well. They are rated for higher voltage, capable of higher current and have higher gain. About £4 / $6 each. Neither of those are darlington transistors; if the PD1515 is a darlington (as the 2SD1515), you need a different type. That's why I asked about the B-E voltage reading, that should hopefully show if it's a normal transistor or a darlington. We both are in the same ship regarding 2N3055. PD1515 I believe is superior than SIT/Vfet Transistors in a way. Once Again Thanks soo much Dear Rjenkinsgb for helping me & supporting. 1.Yes I too believe PD1515 isn't a Darlington & I believe it's some kind of Exotic Ultra Rare Vfet type of Transistor or I'm just getting Delusional. 2. I Think the 2nd Cosmic LAB-3000 Stereomaster amplifier seems to be equipped with MJ802G Transistors only cuz ther isn't any info on them. After seeing your suggestions I checked MJ802G & it resembled exactly with my other Amp of same model of which I mentioned in earlier reply. For info; with the BUX39 or 2N3055 etc. ever working at all in those amps, the PD1515 can only be just a standard bipolar transistor and not a FET/SIT/VFET - those need totally different bias and drive circuits and there is no way the two classes of parts can be interchanged & function at all. If your other amp has MJ802Gs in it, I'd definitely go with those, from a reputable supplier. Edit - And another point to note: In the photo of the BUX39 on the amp, it appears to be fitted with stacked mica washers and no heat transfer compound. That may well have allowed it to overheat as a "dry" fitting does not pass heat well. Use a single, thin, defect-free mica washer with a small amount of good quality white zinc-oxide based thermal grease. Do not use the metal based stuff sold for PCs, it can short things out and most types are not actually very good anyway; generic industrial white compounds are as good or better. I too Strongly believe that when it comes to my both Amps but most of Cosmic (1990-2000's) amplifiers came with 2N3055(HV) Transistors. prior to 1990 or 80's Cosmic were using imported Transistors which includes from MJ802Gs (1970's) to PD1515 (1980's) infact not just transistors but more than 90% of the components were imported from various countries. the PD1515 can only be just a standard bipolar transistor and not a FET/SIT/VFET - those need totally different bias and drive circuits and there is no way the two classes of parts can be interchanged & function at all. I was just exaggerating scarcity of PD1515's just like Vfets. Actually VFET's are easily accessible than PD1515's that makes them more exclusive. I would too Dear Rjenkinsgb. Thanks for letting me know about MJ802G. Though the 70's Cosmic Amplifier having these Transistors are in pretty Good condition as of now but can't say what could go wrong in near future so this would help me rectify whenever i get into trouble. As far as 80's Cosmic Amplifier is concerned which came with PD1515's I Love to fit the original PD1515's only let it be from Mr.Fezder or anywhere from the world. bcuz this Amplifier was bought by my father so that makes it more significant to make it sound & seem exactly like it was when it's was bought home brand new. Ok no I won't & I won't let my Tech Guru do it too as he is taking care of these matters. For being soo Supportive & Helpful by drawing attention to very vital things in my Amplifier case. Thanks Dear "Most Helpful Member" ! Glad you enlightened me about the Complimentary Transistor model too or else it would be an issue whenever I might get into trouble with the Amplifier having MJ802's. Then how come my 80's Cosmic Amplifier has same PD1515 Transistors for both halves? Kindly forgive me if I'm being too naive. Though I'm saying my 1970's Cosmic LAB-3000 Stereomaster Amplifier has MJ802G's bcuz of the resemblence but I don't know whether these Transistors were manufactured or available in 1970's so kindly Enlighten me. There are various (many, in fact) different designs of audio amplifier power stages. Some use two similar transistors for the output stage like yours, others use complementary transistors. It was called 'quasi-complementary', and was used before complementary power transistors were available. For germanium transistors they would have been PNP (NPN power devices weren't available), whereas for silicon devices they were NPN (as PNP were either not available, or rare and expensive). Once decent devices of both polarities were available, then it made more sense to use complementary designs. In theory complementary are 'better', but some of the best sounding amplifiers were quasi-complementary. Which Design is your Personal Favourite Dear Rjenkinsgb? 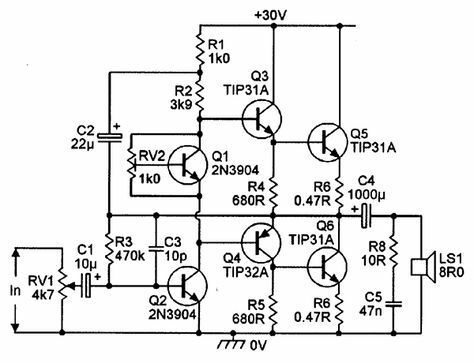 In Transistor Amplifiers I Like First Watts's SIT-1 Mono Power Amplifier (For Fullrange Drivers@Front Horn + Rear TL) & Sunfire Class-G/H Stereo/Multichannel Power Amplifiers with separate Voltage (Low's@Subwoofer) & Current outputs (Mid's & Hi's@Ribbon/Planar/Electrostatic) for Speakers. So which Method or Design is better than the other & why? Dear Rjenkinsgb. I think complementary amplifying devices are a Distinctive feature of Transistor if I'm not wrong. I don't know whether ther are complementary vacuum tubes/PD1515's out ther ! & Thanks to All the Dear fellow Fm's who would be informing Mr.Fezder about me and my requirement of his Linear PSU's PD1515 Transistors. Germanium transistors they would have been PNP (NPN power devices weren't available), whereas for silicon devices they were NPN (as PNP were either not available, or rare and expensive). Yes ! My all three Cosmic LAB-3000 Stereomaster(2)/MK-II (1) Amplifiers have Germanium Quasi-Complementary Driver Transistors ( BC157A & BC147A) in them. if I'm not wrong about they being 100% Germanium or Quasi Complementary Design. some of the best sounding amplifiers were quasi-complementary. How about First Watts's F-1/2 (Transconductance Amplifiers) & SIT-1/2 these are Single-Ended Zero Negative-Feedback Class-A Jfet/Mosfet & Vfet Transistor Amplifiers and they Sound Best ! Thanks Dear Nigel Goodwin for Enlightening about various Technical Aspects of PP method's designs & gain device's unique qualities. I said +-50 V rails because Vce is about 100V. 2x the rail voltage is good practice for audio finals. This http://leachlegacy.ece.gatech.edu/lowtim/ is a really nice amp and it uses the MJ802 and MJ4502 transistors or did. It looks like they found substitutes for them. I built a version of this amp in the mid 80's. I love it. 'Best' is a purely subjective term, and on double-blind listening tests with random listeners I bet there's no agreement about which sounds 'best'. However, single ended FET and zero negative feedback doesn't sound like a recipe for high quality - FET's have pretty well been dismissed now as they have now decided they sound worse than bipolar. As has already been mentioned, BC series transistors are silicon - the 'B' actually refers to this, small signal germanium transistors start AC (where the 'A' means germanium), other letters are used for other chemicals. It would be VERY rare for an amp to use silicon outputs, and small germanium devices (I don't think I've ever seen one? ), however you did see occasional amps with germanium outputs and silicon small signal devices (a LONG time ago). 1.I too found same info but I was made to believe that driver transistors were of germanium but I have a Cosmic Amplifier of 1960's it really has Germanium Transistors in it. 2.Does Silicon NPN being faster is superiority over Germanium PNP Transistors? http://leachlegacy.ece.gatech.edu/lowtim/ This is a really nice amp and it uses the MJ802 and MJ4502 transistors or did. It looks like they found substitutes for them. I built a version of this amp in the mid 80's. I love it. That's Wonderful Dear Most Helpful Member ! Thanks for correcting false info & Being Helpful. 'Best' is a purely subjective term, and on double-blind listening tests with random listeners I bet there's no agreement about which sounds 'best'. 1.But I strongly believe it's not just the Amplifiers which make the sound best ! it's actually the Speakers & Enclosures, which has a very direct affect on our ears and all the other senses which perceive from infrasonic to ultrasonic. 2.I been Enjoying Coral Flat-10 (Mechanically Crossovered) Fullrange Drivers in a (Variable Acoustically Crossovered) Transmission Line Enclosures for last three decades driven by PP CL-A2 Amp somehow nothing sounds Best than this "FRD@TL" Concept to me. 3.I Love Compound Horns too. However, single ended FET and zero negative feedback doesn't sound like a recipe for high quality - FET's have pretty well been dismissed now as they have now decided they sound worse than bipolar. That's very Nice to know but wher it's been dismissed? in DIY Community? actually the reason I believed that my Amplifiers has Germanium Driver Transistors bcuz Cosmic made few small low wattage Germanium Transistor Amplifiers from 1960-70's of which I have one. Thanks Dear Nigel for being Supportive. Otherwise, I thought the only thing going for it was low Vbe. No Wonder we are preferring Germanium then. 2.Ultra Low Impedance Bose 1 Ohm speakers (My Brother got 901) are actually 0.7 Ohm bcuz Cheater Car amps can go as low as 0.05 Ohms so where is the problem? Thanks Dear Most Helpful Member for drawing attention to unique characteristics of Germanium. We don't, and that web page made very little sense - basically it said what we all know, that it's become quite fashionable among some musicians to use old style germanium based distortion pedals.